Gameday: Amerks Travel To Hershey · Let's Go Amerks! At the start of the season these three upcoming games against the Hershey Bears were games that we were looking forward to. They were supposed to give us a preview of the Calder Cup finals. They were supposed to be the two elite teams in the AHL in an early season battle. With call ups and injuries we’ll get the opposite. 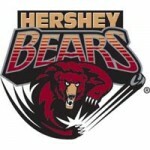 The game will be a shell of an Amerks team playing against a full roster of Hershey Bears. I think our hopes for the game are in the hands of Graham Mink and Alexander Salak. If anyone is to motivate the team it’s going to be Graham Mink. Mink is a two time Calder Cup winner, both of those when he played against the Hershey Bears. Alexandre Giroux and Keith Aucoin were just sent back to the Hershey Bears and Mink commented on that with a smile saying, “I would have liked to see those two in the NHL longer.” They are two of the premier players in the AHL. Both teams took a five hour bus ride on Friday night so travel should not be an excuse for either team. The Amerks traveling from Rochester and the Bears traveling home from Albany. It feels like I continue to say that a game will be a test for this Rochester team and it’s because it’s always true. The team playing now is not what Jody Gage and Ted Nolan imagined at the start of the season. If this shell of a team can find some more chemistry and gain that extra second into their skating they can pull out some wins. Alexander Salak will get the start and if he can make some big saves we may have a chance. The live chat should start around 6:45pm.